DropBox Inc. has established a wide range of customers in the industrial and commercial construction industry, not just in the U.S. but around the world. Everything from containerized restrooms, Blast Resistant Modules (BRM), modular chemical labs, and ground-level workshops have been custom designed, engineered, manufactured, and delivered to meet our customers’ site-specific needs. 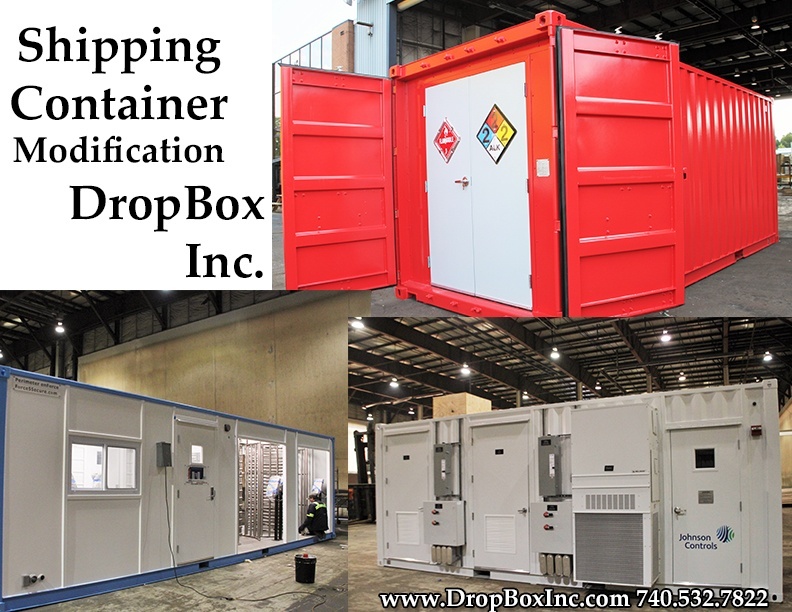 At DropBox Inc. we make it a point to listen to our customers and to provide custom shipping container modifications that meet their unique and specific needs. We have modified everything from the simplest tool cribs to highly customized ground-level chemical labs and portable work stations. Many of our customers need a portable solution to meet their need for onsite work stations for hose repair, and other work shops for carpentry, water testing and filtration, and welding training and testing. Many of our customers need an enclosed climate-controlled area with pre-installed welding equipment, cutting devices, saws, as well as over-head gantry cranes. Our 20’ and 40' portable work stations are customized to facilitate onsite work that would otherwise have to be performed off-site with long turnarounds and big bills. The portable ground-level work stations we provide help save our customers time and money because these tasks can now be completed without having to leave the jobsite. The main advantage of the portable onsite work stations we provide is that they can be placed anywhere and moved easily from location to location. Thanks to the durable nature of shipping containers, our work stations can be climate-controlled and provide an enclosed work space with the right equipment regardless of their destination. 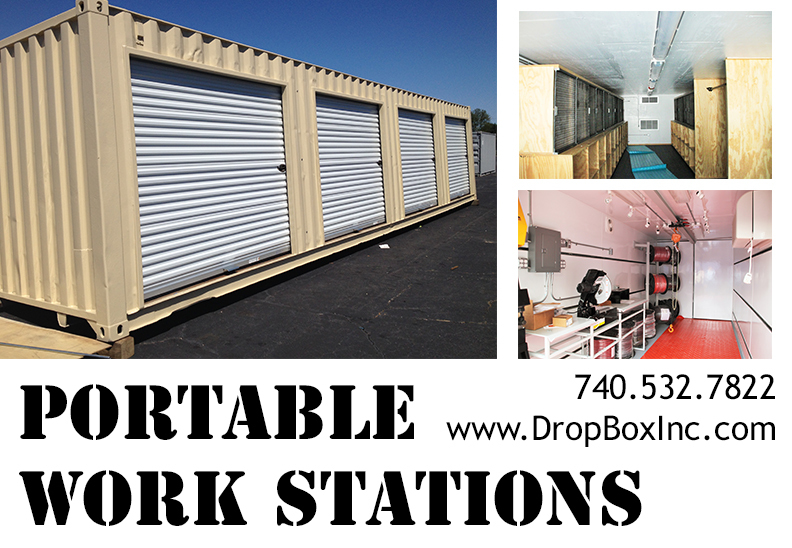 Regardless of your work site needs, DropBox Inc. can provide the portable shipping container modifications you need to get the job done on time and under budget. DropBox Inc. Why We Work! Visitors to Portable Solutions Group and DropBox Inc. will notice a little something new when they approach our facility. In an effort to maintain focus on a long-running standard of excellence in robust safety and quality a new set of banners and signage are now prominently displayed right outside our front door. According to Mark Fields, VP of Sales and Marketing, "This is our family focus for 2019. On Monday we will kick off the ‘Why We Work’ campaign. The pictures inside the ‘Why We Work’ letters are pictures of family members and people that matter to our employees. 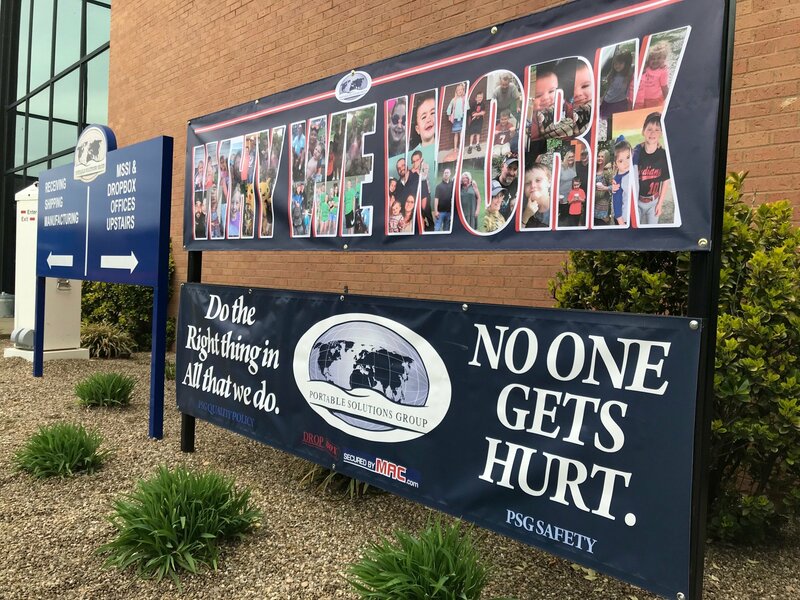 We have also placed additional banners like this around our manufacturing facility to remind everyone of “Why We Work” and the need for safety every day. There are people who want and expect us to come home safe and well. And that's what we are trying to emphasize for our employees and visitors to our facility." We'd like to give a special thanks to Megan Coffey, Executive Assistant to CEO/Owner Rob Slagel, for all of her assistance in getting this program going and putting together the banners, which were designed and printed by Speedy Signs in Ashland, Kentucky. 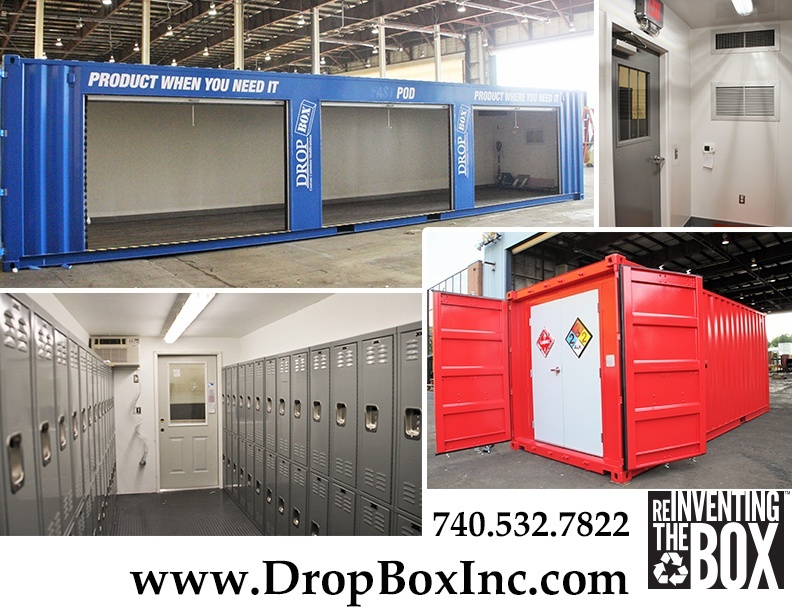 At DropBox Inc. we offer a wide range of shipping container modification products and can ship our products anywhere in the United States and around the world. Worthington, KY-based DropBox, Inc., today announced it has entered into an approximately $2.15 million contract with the U.S. Department of Homeland Security’s (DHS) Countering Weapons of Mass Destruction Office (CWMD). full-time jobs to fulfill the requirements of this project. The specialized container-based scanning units will be positioned at U.S. ports and will be deployed specifically to scan incoming overseas shipping containers for nuclear material that can be found in “dirty bombs” and/or other potential weapons of mass destruction. 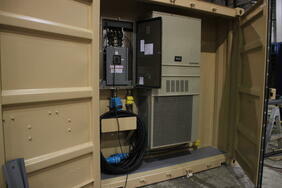 The ODRSCPs will be manufactured at DropBox’s Worthington production facility. The Sept. 11, 2001, coordinated terrorist attacks that took the lives of nearly 3,000 innocent people brought a renewed commitment to border security and led to the creation of the federal cabinet department known as the Department of Homeland Security, which is responsible for ensuring the country’s public safety. In the aftermath of 9/11, a series of major initiatives to combat terrorism were advanced across the U.S. Securing America’s ports was one such priority initiative, with a sharp focus on analyzing shipping containers for radioactivity. In 2010, only about 5% of all overseas shipping containers were being scanned at U.S. ports for radioactive material, leaving 95% of inbound shipping containers potential ticking time bombs. Around 2010, Congress mandated the DHS commence work to reverse these percentages. And that’s where this story, and the aforementioned DropBox contract with DHS, begins. Upon a ship’s arrival at a U.S. port, containers are randomly selected and placed on large straddle carriers up to 40 feet tall, a necessary step for moving cargo containers from the dock to railroad cars or trucks. On their way, the straddle carrier must stop and place the container on the ground for manual scanning by individuals with wands. This process is labor-intensive and often creates a bottleneck, particularly at the busiest ports. 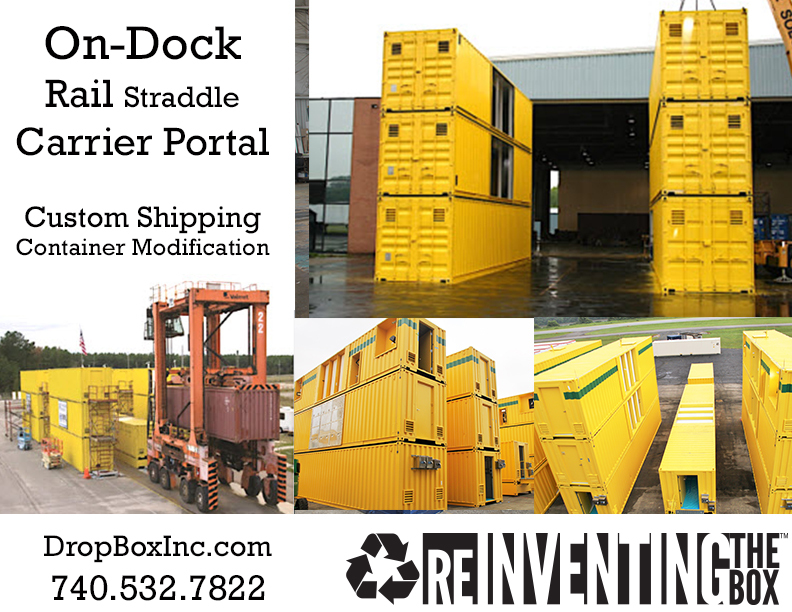 The DropBox On-Dock Rail Straddle Carrier Portal streamlines the current process by reducing the need to stop and place the container on the ground for manual hand-wand scanning. With the ODRSCP, both the straddle carrier and shipping container pass through the ODRSCP’s high-tech, automated scanner tunnel on their way to the railroad car or truck. The process flow is continuous and seamless. By streamlining the hand-off of containers from the straddle carrier to the railroad car or truck, higher percentages of containers can be scanned. It also strips time and cost out of the supply chain, unclogs bottlenecks and helps speed merchandise to market, thereby reducing inventory carrying costs. The ODRSCP development project has been a nearly decade-long labor of love and perseverance. Indeed, DropBox’s path to securing the DHS contract began in 2010 when it was selected to build an ODRSCP prototype for the Savannah River National Laboratory (SRNL) in Aiken, SC. The Department of Energy’s Savannah River Site (SRS) is a 310-square-mile secure site located on the border between South Carolina and Georgia. Here, the SRNL has the capability to provide multiple venues in support of projects related to the defense of the U.S. homeland. 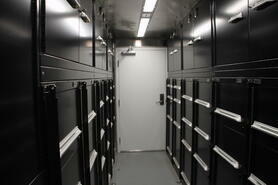 In partnership with the SRNL and the DHS, DropBox helped engineer, design and construct the original ODRSCP model. After completing initial testing at SRNL in 2011, the ODRSCP was disassembled and delivered to Norfolk, VA, where it was reassembled and required to pass secondary testing, in full function, at the city’s shipping port. In 2016, the prototype was shipped back to DropBox’s manufacturing plant in Worthington for minor modifications, refurbishment and still more testing. After the refurbishments were made, the prototype was delivered to the Port of Tacoma in Washington state, where the unit is currently in full operation, scanning containers coming into the U.S. from overseas. 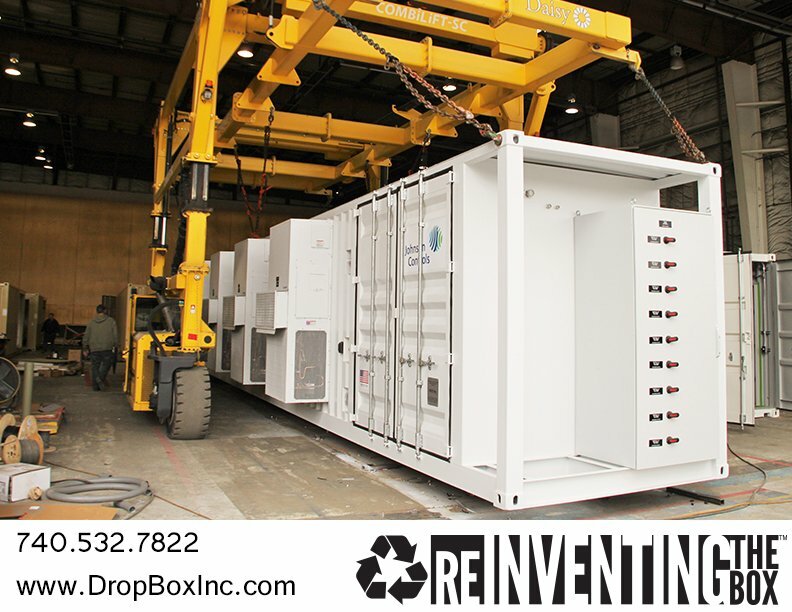 In the coming months, DropBox will begin production of more of these ODRSCPs, now fully designed and vetted, for deployment to more of the country’s busiest container ports. “Senator Paul and Governor Bevin are to be commended for their vision for Kentucky,” said Robert Slagel, President and CEO of Portable Solutions Group, parent company of DropBox. “On behalf of our nearly 130 dedicated employees, we are honored to do our part to help validate the governor’s bold vision to make the Commonwealth the engineering and manufacturing hub of excellence in the world. “To Senator Paul, I certainly thank him for his unwavering support of Right to Work. As an entrepreneur and small businessperson, this support is certainly what inspires me to keep driving forward to create more and better-paying jobs for the citizens of eastern Kentucky and all of Appalachia. 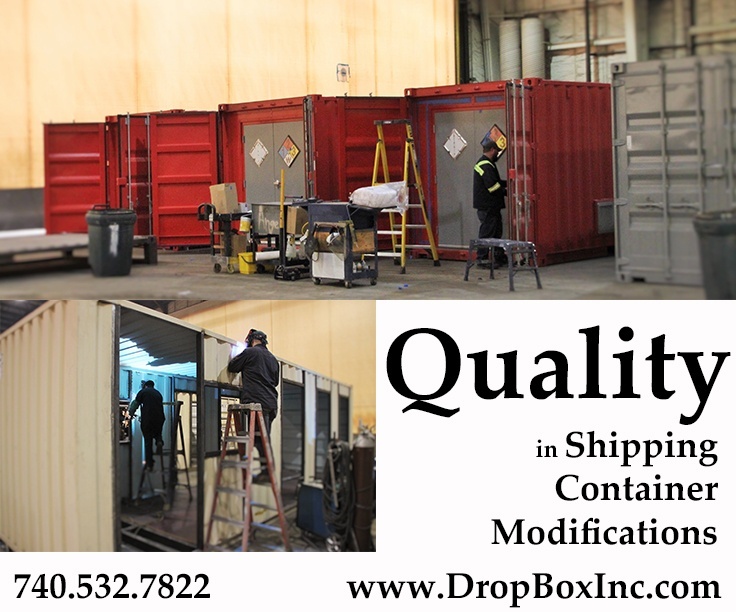 DropBox Inc. recently completed construction on two custom 20' shipping container modifications for one of our repeat customers. Customers from all over the world repeatedly contact us with their own set of jobsite circumstances, seeking out our expertise in industrial/commercial construction site solutions which are portable, turn-key, and often custom built to be delivered for temporary or permanent installation. 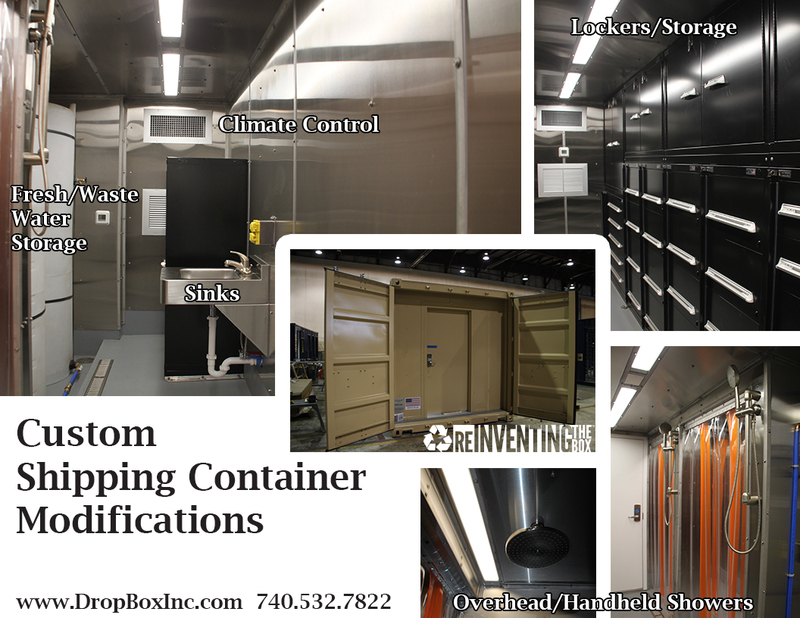 These custom units come complete with lockers/storage, overhead/handheld shower systems, climate control, and containment for fresh and wastewater. Designed to facilitate end-of-day cleaning prior to leaving the jobsite, units like these could be highly useful in an abatement settings and major industrial outages/turnarounds. While typical shipping containers have doors that open on one end, these custom shipping container units have doors on both ends with one dedicated to access the electric/hvac equipment in one end, and a man-door for entry on the other in order to provide the maximum amount of space available on the intended jobsite. The walls and ceiling are stainless steel, and we rubberized the floor to make it tough and durable enough to withstand the rigors of an industrial construction site. 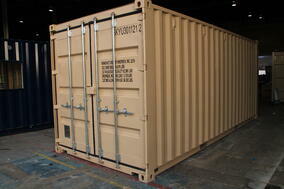 Do you have an idea or a need for a shipping container modification on your next project? Do you need something turn-key and easily installed from jobsite to jobsite? Have a limited amount of space? 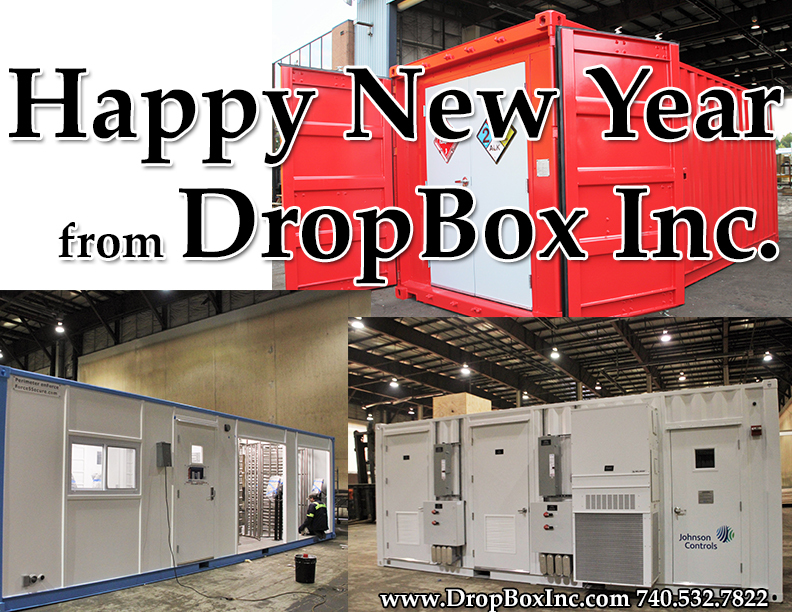 Happy New Year from DropBox Inc.
At DropBox Inc. we offer a wide range of shipping container modification products and can ship our units anywhere in the United States and around the world. In an effort to make the engineering/design process as smooth as possible for our customers we offer specification documents, engineering, drawings, and can provide the credentials needed to make sure you know the product you get is the product you need to provide the required solution to your site-specific concerns. Whether you need additional restroom space, locker space, laboratories, blast resistant modules, or just a ground-level office, DropBox Inc. has the experience and products to meet your needs. We have a long running relationship building products for industrial and commercial construction companies as well as the military and government entities. We have become the go-to, one-stop shop for project managers, procurement professionals and end users when it comes to supplying their projects and jobsites with top-of-the-line solutions to help make their projects run smoothly. 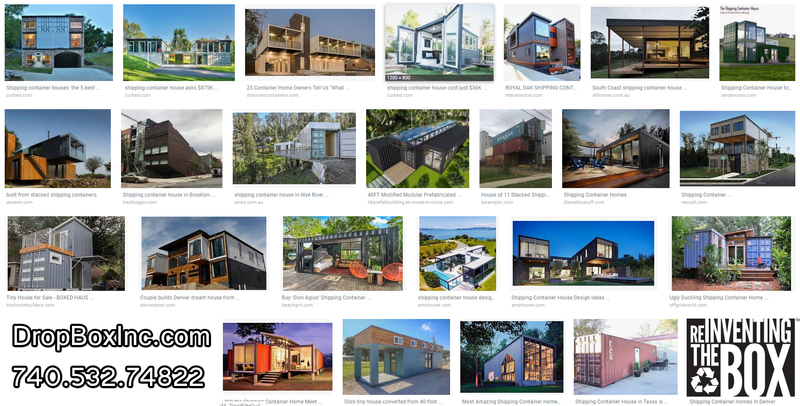 Shipping container design, engineering, and manufacturing professionals on major industrial and commercial construction sites have found the reuse of shipping containers more and more advantageous because they can be built into a wide range of products. At Portable Solutions Group, parent company to DropBox Inc. and Modular Security Systems Inc. (MSSI), we strive to do the right thing in all that we do. In the process of living out our quality policy we are dedicated to meeting and exceeding the expectations of our customers’ statutory and regulatory requirements, continuously improving our processes to provide increasing value to all stakeholders, and cultivating a positive, satisfying work environment. PSG management defines the sequence and interaction of processes required to meet customer satisfaction, along with metrics to determine the system’s effectiveness. The system is implemented through quotes, purchase orders, and contracts including drawings, workmanship standards, work instructions, checklists, and training. Upper management develops goals and objectives annually, which are translated into actionable items for each team member through the S.M.A.R.T. goal process. Management’s review of the system is conducted at least annually to compare results against goals and objectives and foster continuous improvement. Our sales and design team partner with our customers to select a standard product, modify a standard product, or develop a new product design. From start to finish the design is jointly created and developed with our customers via drawings and quotes for the work, to build and deliver the product specifically to meet their needs. When required, drawings are reviewed and approved for manufacturing by a third party or applicable state authority having jurisdiction to determine code compliance with modular building codes. Quality and engineering processes performed by PSG companies ensure the design complies with applicable codes. The vast majority of purchased materials are readily available, standard commercial products. Their design is largely defined by industry standards, building codes, and independent certification bodies. 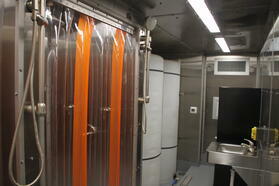 Design requirements for custom purchased materials are conveyed to the supplier by purchase orders and/or drawings. Relationships are cultivated with vendors based on their ability to provide the requisite level of service at a price that reflects delivered value. Priority is given to local vendors. At PSG, manufacturing personnel are qualified via third party certification and/or on-the-job training during their probationary period or when re-assigned. During that time they are given progressively complex tasks to complete. At the end of the probationary period, the team leader and Manufacturing Management determine if the person is qualified, requires more training, or will be re-assigned. Welding is performed by and under the supervision of certified welders. Electrical wiring is performed by and under the supervision of licensed electricians. Any needed plumbing is performed by and under the supervision of licensed plumbers. For PSG to do the right thing in all we do and to ensure the satisfaction of our customers, all products and processes are monitored to assess their effectiveness in meeting with our quality standards.